Astad Deboo is a contemporary Indian dancer and choreographer in Mumbai, India. 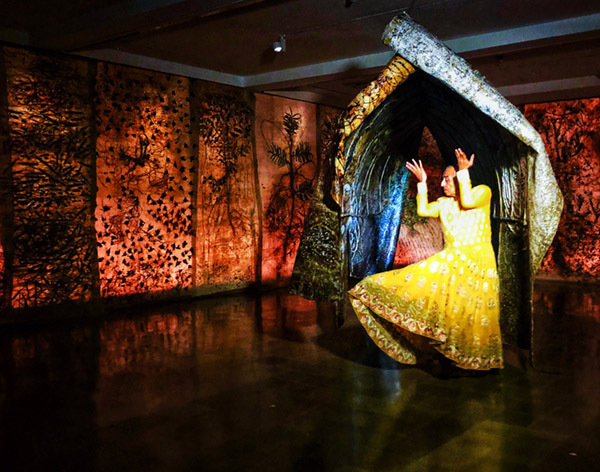 Now in his 70s, he has spent his career contributing to and shaping the field of contemporary Indian dance. Here, he describes his upcoming piece, Inter-Connect, as well as shares aspects of his career, including working with Deaf students and street children. His newest work, Inter-Connect, will premier on November 30th at the Tata Theatre in Mumbai. 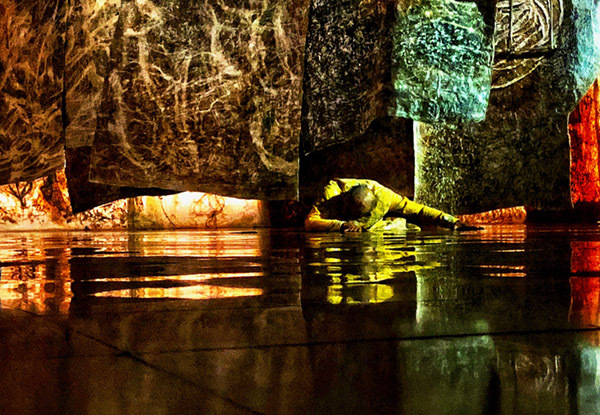 All photographs are by Ritam Banerjee and are from Astad’s last solo, Dream of Sunshine, which responded to the art of Jayashree Chakaravarti. You’re known for pioneering contemporary Indian dance. How did you develop your aesthetic? Were there particular choreographers or teachers who influenced you? I was trained in Indian classical dance in the Kathak style, which I studied from the age of six to 16. Then I came to Mumbai to study economics at the university. At that point, my parents made me put a hold on dance to concentrate on my studies. In 1967, I saw the Murray Louis Dance Company. I had never seen modern dance before. I grew up in a town called Jamshedpur (today it’s a city). I had seen a lot of Indian classical dance, but one rarely saw modern dance. I was taken aback by how multiple bodies flowed with such grace. It made me really curious. It so happened that an Indian dancer who was studying at the Martha Graham School came to Mumbai right after Murray Louis and did a small performance for which I was selected to dance in her choreography. I told her about my interest in modern dance, and she said it shouldn’t be a problem to get me the Form I-20 to allow me to go to New York and study at the Martha Graham School. As I was finishing at university, a school friend returned from a hitchhiking trip around Europe. He narrated his experiences, and I got very excited and decided to also do that. My parents looked at the pros and cons of my plans and let me go when I slipped in that from Europe I had a scholarship to study dance in the United States, which I never had. The way I left India was on a cargo boat with goats and sheep. I traveled in the bottom bunk of the ship. In those days, you couldn’t travel out of India at the drop of a hat. I sailed to Iran, and from there I hitched up to Paris, Dover and London. I started applying for my US visa, but I did not get it and gave up the idea of going to New York. Instead, I went to The Place, home of the London Contemporary Dance School. I did an exchange teaching Kathak to take classes, and in three months I knew that the Graham style was not for me. I decided to travel again, which I did for seven and a half years. I went to 32 countries and all the continents. I took classes and started developing my own work. I was invited by Pina Bausch to join her company and started off as an apprentice, an invaluable experience in my development as a creative artist. When I came back to India after eight years having been away, I started studying Kathakali, another dance technique from India. I wanted another vocabulary in my movement bank. I returned in November 1977, and in November 1978 I presented my first solo show. In those days, my work was a mix of lighter and more serious stuff because I was the first Indian dancer to step into this school of doing contemporary dance. For someone who’s never seen contemporary Indian dance, how would you describe it? There are two lots of us who are practicing and performing contemporary dances today. The first lot has trained in a classical Indian dance technique. They have taken their technique and evolved it, gone abroad, and developed their own style of presentation. The other lot is the newer generation. Few have gone abroad to study, though some have taken classes. They often look at videos in lieu of training. Their work is more theater than dance – they’ll walk, sit or roll. By and large, most of it I find boring. The people who have evolved their own style out of Indian classical dance are more on the scene than the younger ones. Some have diversified from an Indian classical training to just calling themselves performers, and in their choreography they prefer to be more physical. My work, though it may be abstract, has a lot of emotion that goes into the presentation of the choreography. In Indian classical dance, there are nine emotions. Even if I’m taking my hand from right to left, it automatically has some emotion, which I use as a gear to navigate the work. In Indian classical dance, there are definite hand gestures and facial expressions, but it’s not necessary to me to use that vocabulary all the time. Now that I’ve become so minimal in my movement, a lot of people say it’s more like butoh. 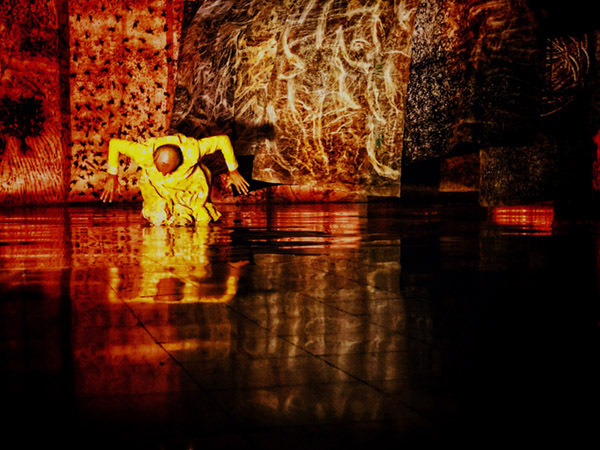 I have seen a lot of butoh and I lived in Japan, so those influences creep in. But I don’t say, “This is Japanese” or “This is Indonesian.” I just follow the flow of the movement. Can you share a little about your upcoming show, Inter-Connect, and what ideas or themes you are working with? 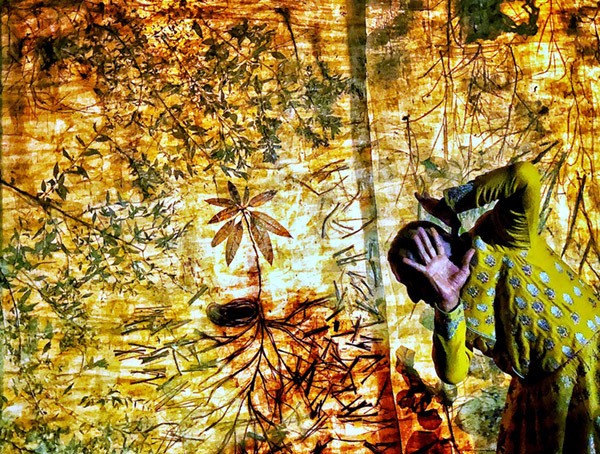 In my previous choreographies, I’ve collaborated with drummers, martial artists, puppeteers, visual artists – a whole range. With Inter-Connect, I’m working with Bahauddin Dagar, who comes from a great tradition of Indian classical musicians. The style is called Dhrupad from north India. He plays the veena, a string instrument that was taught to him by his father. He’s very respected. For him to come on board was exciting for me, because he’s very particular about who he plays for. A few years ago, he and I were put into a situation at a dance movement conference where the organizer asked me to do something with only 24 hours’ notice. I asked Bahauddin if he wanted to jam. The response was tremendous. The theater at which we will be performing our upcoming work, the National Centre for the Performing Arts, asks for a new work from me every two years. I asked Bahauddin if he wanted to come on board for my next work, and he readily agreed. We also brought in a singer, Chintan Upadhya, and a percussionist, Pratap Awad, on the pakhawaj. All of them are performing for me in the pure Indian classical technique, in which they are proficient. However, the drummer would normally play on a definite beat, but here I said I don’t want a downbeat. Perhaps tap – pause – tap tap – pause. Similarly with the veena, he comes in very gradually, and then stops, and then comes in again. It will be a 60-minute work relating to nature. There will be an LED screen as a backdrop with the sun rising quite crimson red, and then slowly it goes into blue, then gray, then dusk and early night where the stars start coming out. The movement is very minimal. When it comes to the veena, it’s like a slow dissolve like on television from one image into the next. That’s how the movements will go as well. I may start off in the center, and gradually I move to the right or left side. The mudras, or hand gestures, will be very prevalent. There is an aspect of playfulness; I might sometimes respond with quick movement or maybe just with my fingers. There is also a mood of reverence and offering. When the singer comes on, he sings a few lines from a poem about moroseness and loss, but in the end there is hope. How has your choreographic process changed over your career? The themes I chose in my earlier days were a mixed bag. I did a work on insomnia and on drug addiction. I did a work about three geometric objects – a triangle, a rectangle and a square – showing how they moved with me as a catalyst. Then I started collaborating. I worked with puppeteers showing the many faces of death through little vignettes. I showed death as a concept, a lover, a celebration and a liberator. The puppets performed alongside me. When I worked with martial artists, the gurus were not open to having a practitioner like me come on board. I told them I would keep their tradition intact. But it was still a challenge for them – usually they perform to a drum for 20 minutes. Getting them to listen to eclectic music and receive cues was difficult. I then worked with drummers and took their drums away from them. It was like their security blanket had been lost. We worked with imaginary drums. Slowly, they started becoming minimal in their movement. Every process is unique and interesting. Can you tell me about your projects with the Deaf? When I started creating dances in India, I used to go to Kolkata to perform. I knew a theater director who worked with the Deaf. I asked to do a workshop on the fly with her actors, called the Action Players. For two years, whenever I went to Kolkata, I did a three- or four-day workshop with them. In the third year, the director asked me to teach for three weeks, and from there we did a little performance of what I had taught them. They all were very synchronized, which required them to learn to count simultaneously to a beat. That’s how, slowly, it began. I was in Washington DC on a trip, and my cousin’s brother-in-law taught at Gallaudet University [a federally chartered private university for the education of the Deaf and hard of hearing]. He introduced me to the artistic director of the performing arts department of the Model Secondary School. I ended up working with the high school students for a good six years. Every year there was a different project where they would involve me. I eventually decided to bring the group from Washington to India and organized a tour. Gallaudet University then invited 15 of the Action Players to come to the US for a month-long camp. They had a great month of bonding in an environment that had so many facilities for them, compared to what we have in India which is practically abysmal. In 2002, Gallaudet decided to host a Deaf festival with participants from 70 countries. Ours was one of the groups for whom the state department underwrote everything. Along the way, I discovered a school in Chennai called The Clarke School for the Deaf where they had girls trained in the Indian classical technique Bharatanatyam. I took the challenge to create a full 60-minute work on them. In each section, the counts were very different. At one performance, I switched the music off, and they continued to dance. They were so much in rhythmic unison, the audience realized the talent and skill of the dancers. I worked with these dancers for five years, and over that time we opened the Deaf Olympics in Melbourne. That particular group traveled quite extensively; we did 75 performances total. Can you share more about your work with street children through the Salaam Baalak Trust? The NGO, which works with street children in New Delhi, approached me. The thing is, everybody wants me to come onboard, but nobody has any money to give me. I have to generate the funds. I have a lot of goodwill, so there are corporations and individual who from time to time donate to my dance foundation. The first grant to work with the Salaam Baalak Trust was given by the HSBC Bank. I created two works with the trust. The first was on boys and girls, and it was called Breaking Boundaries. Then, the country was celebrating Nobel Laureate Rabindranath Tagore’s 150th birthday. I decided to create a work using some of Tagore’s poems and songs. I selected eight young men to work with me, and we toured internationally. I stopped working with them in 2014. After every five or six years, there’s a saturation point artistically, and I need to move on. This year, I was commissioned by the Wildlife Trust of India to create a work on saving the elephants. I brought in some of the street children to create the work, so I choreograph on them from time to time whenever there’s an opportunity. 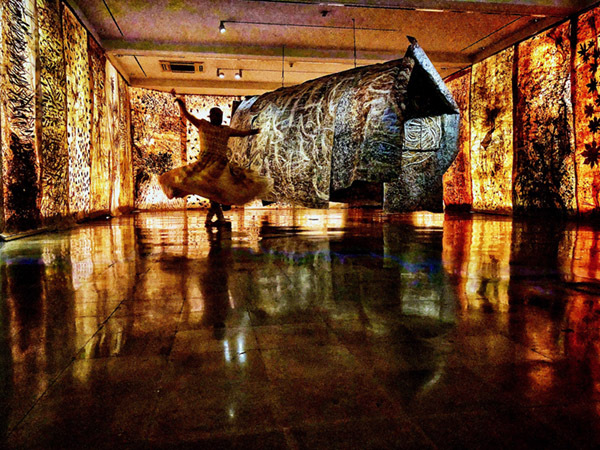 How do you see contemporary Indian dance developing in the future? Personally, I really don’t have any protegees who will take my work forward. I’ve been trained as a dancer since the age of six, so I’ve been dancing 65 years. I know various techniques and have built a vocabulary of movement. It’s very difficult to find a body proficient in Indian classical dance but also physically athletic from the Western point of technique. When I do work with my street children, I try to imbibe in them my kind of movement, and some of them are able to pick it up. There are more people coming from overseas to do workshops. There are more classes as well. Among the younger generation, there’s one dancer-choreographer from the Northeast who is doing very interesting work drawing from his tradition. It’s not easy being a contemporary dancer in this country, even today. I’ve been choreographing over 40 years, and I still have to propose projects and hope grants will be given to develop the work. I’m my own manager, fundraiser and secretary. I wear many hats to keep my work going. The field is still very bleak. I tell younger dancers they must have nerves of steel; you’ve got to persevere and not be disappointed and dejected. It took me one year of going from door to door to find a space that would present my first work. It tests your passion. What a story. It deserves a book. Amazing how well you blend with artist’s Jayashree Chakaravarti work. As if the work is spitting you from her canvas like a blob of colour from her palette!! Congratulations Astad, great performance!! !